In the opening track, “Alpha Flight,” lead singer Billy Yost isn’t afraid to let his voice crack and break over a simple guitar riff that gently reminds us that the Pixies exist. In essence, that’s really the most winning aspect of the band’s music; their songs whisper at their influences without wearing them on their collective sleeve. “Hate this City" opens with a “Lust for Life”-esque drumbeat and quickly settles into a tight garage-y number in the vein of The Strokes’ earlier stuff, albeit with a heavy guitar chorus that suggests the choice cuts from the Clinton-era MTV Buzz Bin. In “Sting’s Teacher Years,” Yost lets his likeable voice do all the work, somehow channeling both influences obvious (Lou Reed) and not so much (Am I the only one who thinks a lot of these affectless singers owe a huge debt to Paul Simon’s conversational tones?) The final, standout track, “Ma/Pa” starts out with a Pavement-ish riff which builds to a sing-along refrain that seems to be tailor-made for live performances. I realize I have mentioned many bands in this review, but I do so to illustrate that there isn’t necessarily anything wrong with being influenced by bands who came before. The danger only arrives when giving the alt-rock gods their due takes precedent over actual songcraft. 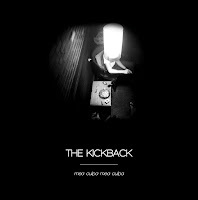 Judging by this brief sampling of their work, The Kickback are doing something all at once incredibly simple and incredibly difficult: They’re creating solid alternative-rock without gimmick, and that’s worth mentioning. This EP is not going to change your life, but it just may provide you with an aural time machine to a period when, at least when it came to music, the song trumped the style and the hype. Ah, the '90s. "No big hair," indeed. Pick up a copy of Mea Culpa Mea Culpa here, and catch the band live at Schubas on Wednesday, March 9th with Now, Now and Santah (tickets here). Listen to the entire EP via SoundCloud below. great review. I am, somehow, already a huge fan of these guys.